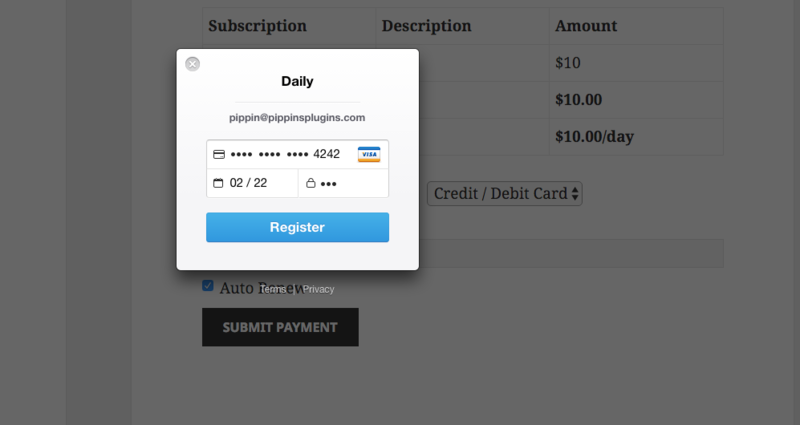 Stripe Checkout is a beautifully simple payment flow offered by Stripe.com that allows you to accept credit / debit cards for membership registrations directly on your Restrict Content Pro powered website. Display on the standard registration form provided with the [register_form] shortcode. 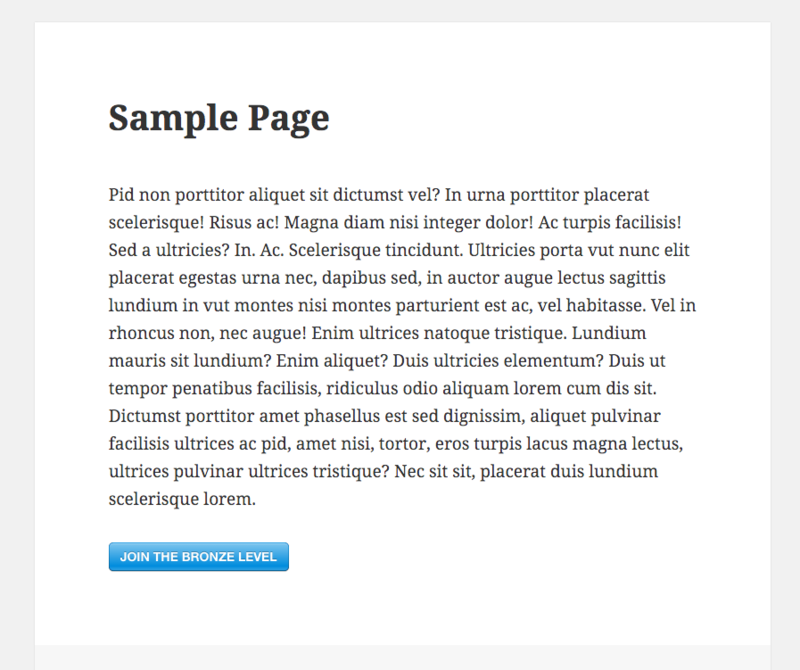 Stand alone display on any page with the [register_form_stripe] shortcode. 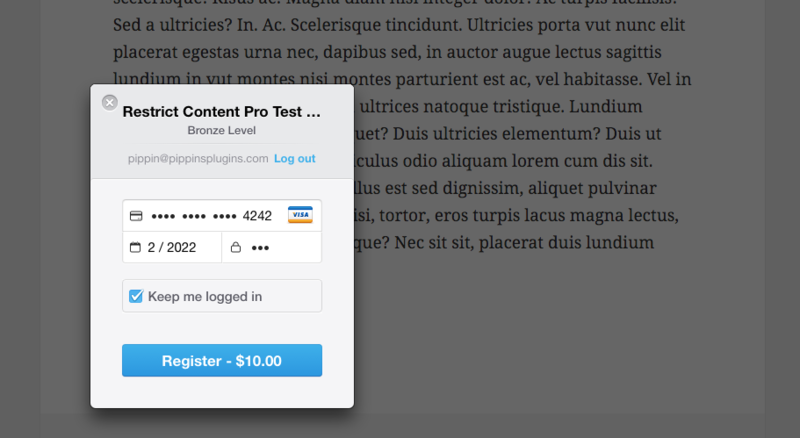 When using option #2, the detailed registration form is bypassed and customers are shown a simple Join button that, when clicked, opens the Stripe Checkout modal window. Through this option, customers only need to enter their email address and card details. The account's username and password are set automatically when the payment form is submitted. Your website can use either option or both simultaneously. 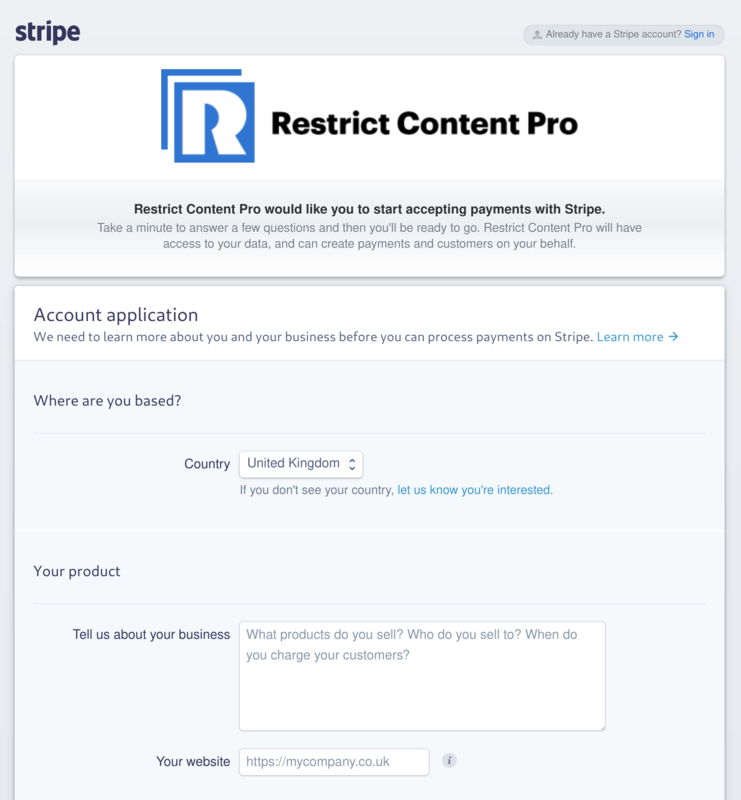 Note: if you would like customers to enter their card details on the page without using the modal window, use the regular Stripe gateway. Configuring Stripe Checkout is simple and only takes a few moments. The URL that Stripe sends webhooks to must be configured manually from your Account Webhooks settings page. 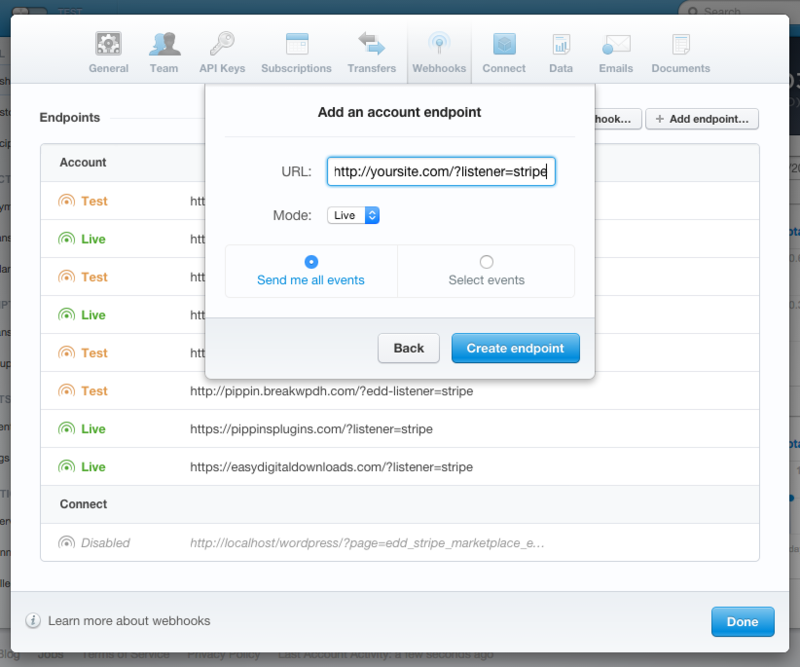 Enter "http://yoursite.com/?listener=stripe" for the URL and select All Events. Replace yoursite.com with the actual domain to your site. If you are using Stripe in Test Mode and you have Sandbox enabled in Restrict > Settings > General, you MUST select Test for the Mode option. 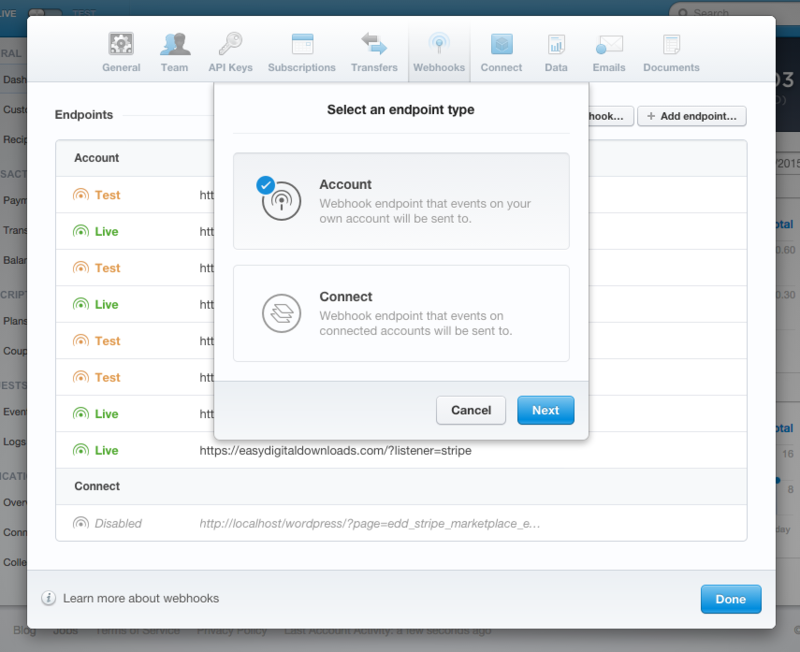 You can also create a second endpoint and select "Test" for the Mode. There are numerous options that allow you to control the exact labels, descriptions, and logo displayed on the Stripe Checkout modal window when using the [register_form_stripe] shortcode. See the [register_form_stripe] documentation for a complete list of options. Connect to your Stripe.com account. Click on the Join button and enter your email address. Enter 12 / 2020 for the expiration or Any date in the future will work. Enter 123 for the CVC code. Click Register / Sign Up. You should now be redirected to the success page and logged-in as your new user. Check your Stripe.com account history where you will see the test transaction.